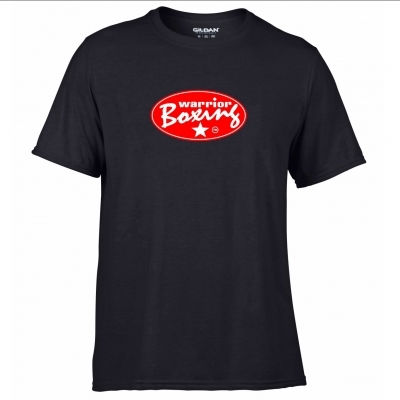 The original Warrior Boxing logo on a 100% Polyester Performance T-shirt....jersey knit for a cotton feel. Not quite as fitted as the Softstyle T and suitable for all ages, shapes and sizes! AquaFX® wicking properties. Freshcare® anti-microbial properties. Twin needle hemmed 5/8" sleeves and bottom hem. Youth - Age Chest (to fit) 3/4 - 22/24", 5/6 - 26/28", 7/8 - 30", 9/11 - 32/34", 12/13 - 34/36"
Adult - Chest (to fit) S - 34/36", M - 38/40", L - 42/44", XL - 46/48", 2XL - 50/52", 3XL - 54/56"